Thanksgiving is Angela's favorite holiday. She looks forward to it all year: the family, dinner, desserts, wine, all without the pressure of Christmas presents! 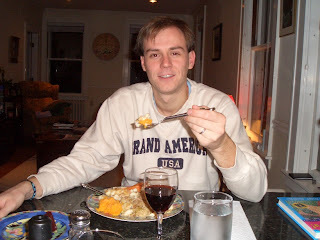 Unfortunately, Guillaume had to work on his First Thanksgiving as a Legal Permanent Resident of the United States. Angela made coffee and a toasted corn muffin for Guillaume, for his breakfast. They watched the Macy's Thanksgiving Day Parade on tv while drinking their coffee. The Macy's parade actually comes from European tradition! In the 1920's, many of Macy's Department Store employees were 1st generation immigrants. They wanted to celebrate this American holiday with the type of festival they loved in Europe. They marched from 145th St. to 34th St. dressed in costumes, with floats, and animals from a zoo! The parade stopped during WWII, but started again in 1945, and was televised in New York. When Angela and Andrew were little, their parents took them to New York to visit their Uncle Michael. They saw the Parade, and they also saw the Christmas Show at Radio City Music Hall, with the Rockettes! Angela drove Guillaume to work today. After giving him a kiss goodbye with a tear in her eye, he ran into the front door of work, and Angela drove off to spend the holiday at Aunt Vas & Uncle Sal's house. There was a lot of commotion in the kitchen preparing all the food! Vas and Sal barely slept the night before. (Angela thinks they were thinking about the turkey!) Andrew brought a Greek dish, spanakopita (delicious! ), made with layers of buttered phyllo dough, spinach, onions, feta cheese, and more layers of buttered phyllo dough! Helen brough a sweet potato dish, and lots of pies! The turkey was cooked to perfection, golden brown and juicy! The table was set perfectly, with fall decorations, candles, and beautiful dishes. Even though Guillaume wasn't there, he was in their hearts, and on their table! This is Angela's plate full of turkey, sweet potatoes, squash, stuffing, mashed potatoes, cranberry sauce, and spanakopita. She tried not to over-eat like she usually does on Thanksgiving. She didn't really succeed. And she gave a "thumbs up" to the meal! She didn't leave anything on her plate, either. Isn't it a pretty dish? After dinner and a little rest, they had some dessert wine that Andrew brought back from California. It was very good! There were a lot of desserts to choose from. Helen made TWO different kinds of apple pies, and she also brought a custard pie. Vas made some Greek cookies that are so buttery (maybe Angela likes these cookies) that they melt in your mouth, and some oatmeal raisin cookies (because Uncle Sal likes them!). Guillaume got home at 11:45 p.m. to find Angela waiting up for him so that they could have their Thanksgiving dinner together. He opened a nice bottle of wine from work, and Angela prepared the dishes. Even though they were sad to have been apart, they were very happy to be together at the end of the day. It is my first "Thanksgiving by blog". I really enjoy looking at your photos and seing your family. One of my wishes would be to share your Thanksgiving with mum and dad! We really have to foresee the next year! Big kisses to the Adinolfis and Vas ' family. We hope all the Rousseaus will be at Thanksgiving dinner next year!